Fresh shrimp bought from your fish monger is really superior, however, often when I want a last minute meal and don’t have anything much in the refrigerator I dig out my shrimp bags from the freezer. 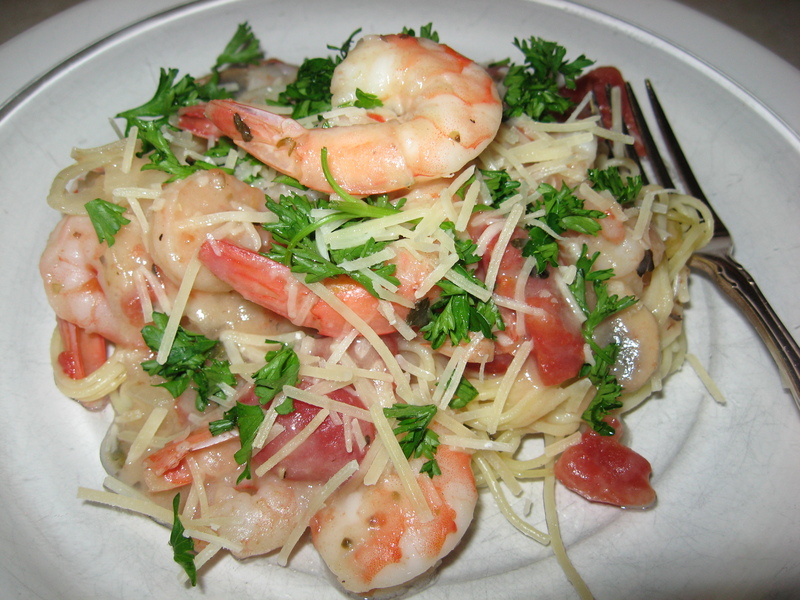 Shrimp are not very high in calories and I enjoy them—even if they do come from a foreign country. I know that there is controversy about this. No matter, for my taste, this is an easy dish to fix and I think that it’s good for just you and yourself (the way I often am) or for your family or even for a company dish—accompanied by a delicious green salad. I like to use the two varieties of shrimp listed below just for the fun of it. As well, for sure you can use fresh uncooked shrimp purchased from your fish monger and then it’ll be even better. You have a bit more work to do, but there’s nothing like fresh uncooked shrimp. If necessary, thaw shrimp according to package directions. Cook pasta according to directions and keep warm. Mix the wine, chicken stock, lemon juice and herbs in a cup or small bowl. In a large sauce pan, warm the olive oil and place the flour in it along with the garlic and onion. Sauté gently over medium heat till they are translucent (about 3-5 minutes). Then add the mushrooms and keep stirring till they moisten. (another 3-5 minutes). Add the liquid ingredients mentioned in #3 to the pan and stir over medium heat till thickened and bubbly. Add shrimp to the mixture; cover and simmer about 2 minutes or if need be, till shrimp turns pink. 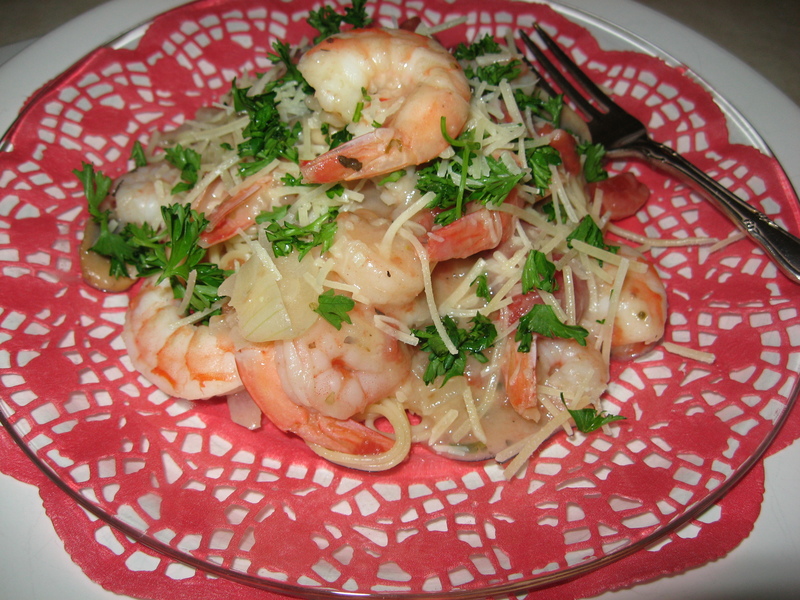 Place the pasta on a pretty dish, top with the shrimp sauce and then a final sprinkling of the Parmesan and parsley. PS–if you want to make the sauce a bit creamier and richer, add some half-and-half to it at the end. Be careful to not boil it.